Can Congress-SP-RLD 'Mahagathbandhan' in UP Stop BJP and BSP? Election commission's decision on symbol and party Akhilesh yadav led Samajwadi party has decided to make 'Mahagathbandhan' against Bhartiya Janta Party and Bahujan Samajwadi party. Samajwadi party is ready to alliance with Congress party and Rashtriya Lok Dal. Akhilesh yadav is ready to leave around 89-90 seats for Indian national congress(INC) and around 20 seats for Rashtriya Lok Dal(RLD). According to sources RLD is not ready to alliance with 20 seats , they want more seats to make alliance in Uttar-Pradesh. 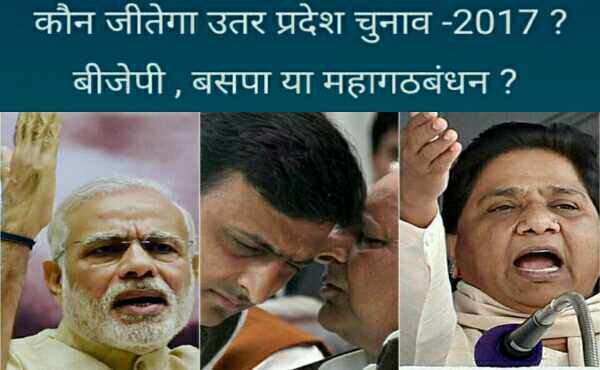 Who will be CM of UP-2017? Some more things about alliance of Congress, RLD and Samajwadi party is given below. - ND tiwari and his son Rohit Shekhar joined Bhartiya Janta Party. - Swami Prasad Maurya in touch with SP leader. - RLD leader and 8 congress leaders joined Bhartiya Janta Party. There is a great strategy behind 'Mahagathbandhan' in Uttar-Pradesh just as RJD and JDU did in Bihar against Bhartiya Janta Party. In previous elections vote percent of Samajwadi party was 25% , congress party 10% and in West Uttar-Pradesh vote percent of RLD in previous elections was around 10%. Around 30% votes carrying party or alliance makes government in state so this alliance is aiming to get around 30-35 % of votes. Votes and government in Uttar-Pradesh depends a lot on religion, community and region. This was biggest reason that every party in state eye on their own vote bank and community. BSP : Bahujan Samajwadi party and supremo mayawati and her politics depends totally on minority votes and Muslim votes. SP: Samajwadi party and Akhilesh yadav will be focussed on Yadav votes and Muslim votes. But in there family drama some vote bank will be definitely shifted to other parties. Congress : Indian national congress and Rahul Gandhi are trying to make their appearance in government so they are ready to compromise in state. Congress Party is ready to withdraw their cm candidate for their appearance in UP. They will be looking to capture more and more minority , Muslims and general votes. BJP: Bhartiya Janta Party is ready to fight against congress , RLD and Samajwadi party alliance as BJP is eyeing on Hindu golden votes, minority votes and other backward classes votes as in first list of BJP there is no Muslim candidate, which shows that BJP is ready to fight against Muslim votes. According to sources Priyanka Gandhi Vadra and Dimple yadav will be star campaigner for 'Mahagathbandhan' in Uttar-Pradesh. In state many posters related Priyanka and Dimple yadav can be seen. Priyanka and Dimple yadav will try to capture more and more ladies votes in state. - Mulayam ready to fight upcoming elections under leadership of Akhilesh yadav now. - Sheila Dikshit CM Candidate of Congress party in UP ready to withdraw her post for 'Mahagathbandhan'. - Congress is asking more than 10 seats where SP had won in previous election so SP candidates can fight on sign of Congress party. - Mukhtar ansari and his party can be out of Samajwadi party soon. - Amar singh is out of party and powers of Shivpal yadav are limited now. - Mamta Benergee, Arvind kejriwal and Nitish kumar can rally for Akhilesh yadav in Uttar-Pradesh. There are some days left for election in Uttar-Pradesh but every party is doing each and everything to get more and more votes to make their government in state , afterall way to Delhi(central government) goes though Lucknow.